1. What is the Motorola MotoActv? 2. What does the MotoActv do? 3. What are the Pros and Cons of the MotoActv? By the end of this review, my goal is give you the information you need to decide whether the Motorola MotoActv is right for you and help you make a more informed decision on if you should buy one or not. What is the Motorola MotoActv? The Motorola MotoActv is the latest big name GPS Fitness Tracker to hit the market and I just picked mine up after seeing it on an end cap display at my local Best Buy. I have had my Motorola MotoActv for about two weeks now and in this review I will reveal everything I love about the MotoActv, what I don't like as well as a bunch of technical facts about the product. I am a spur of the moment kind of shopper, I hardly ever go into a store with a plan to buy anything but if I see something I like or want, I normally buy it and try it out. This is how I bought my Motorola Motoactv, I had never seen any advertising for it and the sales associate at Best Buy told me it just came out but really didn't know much about except he said "it looked cool". Motorola MotoActv Review: What is the MotoActv? ﻿Measures your fitness activities- the MotoActv will track your running, walking, cycling, elliptical, step machine and treadmill workouts. 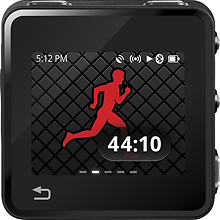 The MotoActv will keep track of your time, distance, speed, and calories burned. Built in GPS- this will help track your outdoor activities. Accusense Technology- tracks your indoor activities and adapts over time to give you a more accurate reading of your fitness results by learning your workouts and strides, basically the device learns your unique characteristics and uses those to provide more precise results. 8/16 GB Smart music player- This is probably the coolest feature I have seen on a fitness tracker, the MotoActv will learn what songs you were listening to when you are performing at your best, what songs motivate you to achieve the highest results and then complies them into a high-performance play list. That's Awesome!!! Training Portal- this helps to maximize your workout level by seeing which song bring out your best performance, set training plans, goals and more. Water Resistant Design- the MotoActv is not only water resistant so you can wear in rain but also sweat resistant. Scratch Resistant Design- The MotoActv is constructed with Guerrilla Glass Display which will prevent scratching. Very Easy to setup and use, I took it right out of box, sync'd to my laptop and set everything up in no time with no instruction needed, it was very easy to sync my iTunes playlist to the MotoActv. With the built in MP3 that remembers what songs you perform best to, its like having a personal trainer and a DJ to keep you active and motivated. Uses the Android Platform which can be connected to your Android smart phones with blue tooth technology. The MotoActv is light as a feather- it only weighs 1.2 oz. Battery Life- 20 hours resting, 10 hours indoors and 5 hours outdoors (the GPS feature does use a lot more battery life). The Motorola MotoActv online portal is awesome, you can see your results, track your progress over time, it really is a nice feature and Motorola has done an awesome job with it. Hands down the thing I did not like the most about the MotoActv was the cost- the 8 GB MotoActv (which comes with device, wired sports headset, clip and charger) runs $249.99 at most stores $299.99 at others, which makes it one of the more expensive fitness trackers on the market. The Display, while the screen is rather larger and easy to see the text and stats only make up about 10% of screen which makes seeing your actual stats a little hard to read. The GPS systems needs an update, when I go on runs I like to have way points, routes, compass but the MotoActv current tracks where you start and the path you take to finish, it does not provide direction or path. Needs a longer headset chord, I really hate short chords, I immediately switched over to my Ipod headset. I have had a few weeks to play around with and get to know my MotoActv, I have always been a fan of the Fitbit personal tracker and always will be but Motorola has done a great job with the MotoActv. You will never find a product that has no flaws, the MotoActv definitely has some room for improvement but the great thing is it is made by Motorola, a company which I am very fond of and a company which actually listens to their customers. After the release of the MotoActv there were several customer recommendations for improvements and Motorola has listened and has addressed many of those in recent updates, others are still on the way. The biggest complaint I have seen is the price, but keep in mind that the MotoActv is like nothing we have seen before, the technology inside is so advanced that it blows the competition out of the water. Think about it, a device that not only tracks your fitness activities but also has a brain and customizes itself to make you perform at a higher level and ultimately achieve higher results. $250 bucks to reach my fitness goals quicker, I will take that any day of the week. 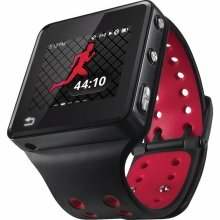 I highly recommend the Motorola MotoActv to anyone who is serious about fitness and looking to track their activities and take their fitness to a new level.